I am reposting here two of JB Baylon's facebook postings about the new DENR Secretary Gina Lopez and the mining industry. These 2 papers were posted by JB last February 26. For me, there are two issues here in the on-going controversial policies of Sec. Lopez: (1) heavy government regulations and taxation of the mining industry, and (2) rule of law, when government revokes the mining/business permits that itself has granted. It seems that some members of your ranks are raising the flag of LAUDATO SI to call for the confirmation of the DENR secretary designate. Please ask these individuals to make sure they have read it and read it well. 1. The Holy Father mentions mining directly ONLY ONCE - on Paragraph 51 where he rails against the harm caused by mercury pollution in gold mining and sulphur dioxide pollution in copper mining. That's in one line in one paragraph out of 246. 2. But the Holy Father mentions "impulsive and wasteful" consumption (par 162), "scandalous level of conusmption" (par 172), the need to modify consumption (par 180) over THIRTY TIMES!! That's THIRTY TIMES versus ONCE. SHE SAYS: : mining is damaging our environment! If you love your country, really really love your country, you should be against mining. The environment is more important than the money the miners make! THE TRUTH: mining covers less than 3% of our TOTAL LAND AREA - so if as she claims that mining does damage the environment in 3% of the country. who inflicts the damage on the rest, on the 97%??? But more importantly RESPONSIBLE MINING means PROGRESSIVE REHABILITATION... and over the last five or so years mining firms have planted over 20 MILLION TREES nationwide. Not to mention coral reef rehab. Finally she has not acted against illegal mining especiallly the small scale operations that pollute the environment, are not required to rehabilitate their mining areas and do not pay taxes properly! SHE SAYS: Mining makes communities poor. Look at Caraga it remains the poorest region in the country! THE TRUTH: Mining communities are far better off with responsible mining that brings electricity, schools, Clinics, scholarships, roads and other businesses. Mining firms spend BILLIONS to fill the void that Government misses in remote areas. Without mining, the residents of these otherwise remote communities will have to fall back on subsistence farming or subsistence fishing. Most mining areas are inhospitable areas or areas whose soil is not loam soil that is perfect for agriculture. Without mining they won't be poor - they'll be dirt poor! SHE SAYS: There is no such thing as RESPONSIBLE MINING. THE TRUTH: On her first day in office (July 1) she was told by Leo Jasareno that all mining firms had to undergo ISO 14001 certification which is the HIGHEST international standard. She hailed ISO 14001 as "another way of saying responsible mining." But maybe the next day she found out that most mining operations obtained their ISO 14001 certifications - so she scrapped that and conducted her own audit. But if ISO 14001 is the HIGHEST standard, then her audit has LOWER STANDARDS, yes? SHE SAYS: Embrace Laudato Si, the Papal Encyclical on Climate Change! 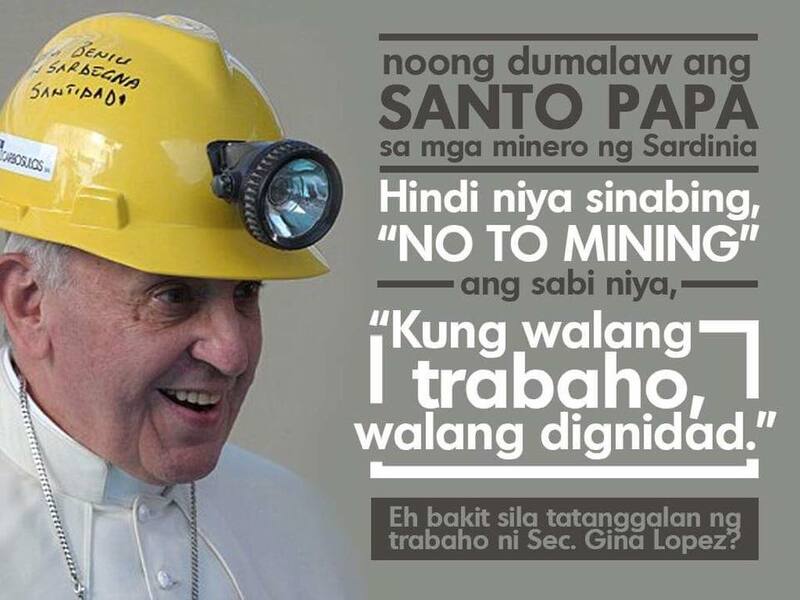 Those against mining use Laudato Si to condemn the industry. THE TRUTH: Laudato Si is made up of 246 paragraphs. 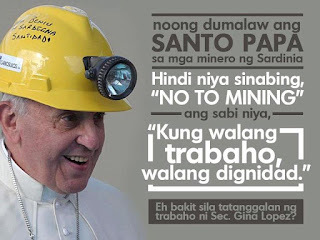 The Holy Father only mentions mining ONCE, in paragraph 51. But he lambasts wasteful and shameful consumption more than 30 times and points out that MEDIA fuels the consumption mindset. She should be LAUDED for her passion. But she should be REJECTED for the position she aspires for because her PASSION colors her MINDSET. Just because she is passionate and a Lopez do not make her a good choice to be Secretary of the Environment and Natural Resources. We need a better one/ someone who knows the Law, is incorruptible, has a fear of God and is no-nonsense. Like lawyer Tony LaViña or geologist Caloy Arcilla. You cant run circles around either of them even if you tried. Let the DENR's loss be the ABS CBN Foundation's gain!